CINCINNATI -- For Katie Waterson, making old homes new is practically in her genes. During her childhood in Bloomington, Illinois, her parents' hobby was renovating Victorians. "We were always living in half-finished houses," she recalled. She and her husband, Nick, lived in Downtown Cincinnati from 2004 to 2007 before they moved to D.C. for Nick's work with the Department of Defense. In 2014, when they were looking to move back here, they looked at 40-some homes before their real estate agent suggested a neighborhood they hadn't heard of: Terrace Park. When they walked into the 1869 historic home dubbed "Gravelotte," they knew they'd found their place. Still, the house wasn't a perfect fit for the family, which includes sons Thomas, 6, and Jack, 20 months, plus a Labrador named Rosie. However, Waterson, who has her own consulting business, knew it could be made to fit the family's lifestyle. "I thought there was a way to keep the traditional bones and what's original while making it work for a modern family," she said. "One thing I've learned from watching my parents do this is you can't rush it." So beginning in January 2015, Greiwe Interiors began a three-year renovation project. One of the biggest jobs was removing a wall to open up the dining room and living room. Before that, the family had to walk into the foyer to access those rooms. Removing the wall also made the rooms lighter and brighter, Waterson said. So did swapping out the heavily Victorian decor with transitional style, incorporating lots of white and blue throughout the home. Waterson said she didn't even realize how much she liked blue until someone pointed out it was all over her house. "I think subconsciously I needed this home to feel calming," she said. "I do like going into a house where it feels like every room connects." Furnishing the house wasn't a quick job, either. Because they moved from a 2,000-square-foot townhouse in Capitol Hill, the couple needed a lot more furniture to fill the 5,000-square-foot house in Terrace Park. "There were many, many months where it was empty until we figured out what we wanted to do," Waterson said. Today, there are ample furnishings and art ranging from traditional to contemporary. Among the canvases are works by Cincinnati artist Lisa Schuster and by Waterson's aunt, Kathleen Loe, of Hudson, New York. Another major project was gutting the kitchen. 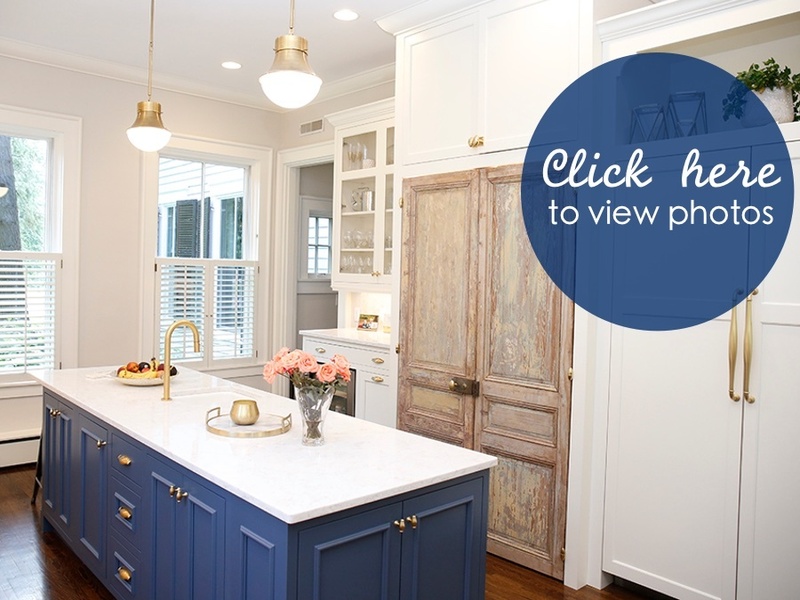 They replaced dark wood cabinets with Amish-built white ones with brushed-brass fixtures. A long blue island running the length of the kitchen replaced a different island that had essentially cut the room in half. With that change, there was enough space to add a little sitting area with a couch, chairs and TV set. One of the most striking features in the room is a set of doors that date back to 1700s France and look like they've been painted and stripped many times. Found in an antique shop, they serve as pantry doors in the Waterson home. Up the leopard-print carpeted stairs are the family's bedrooms, including a nursery for Jack and what friends call "Thomas' apartment." The latter is a bedroom with an attached playroom and an adjacent bathroom that the Watersons added. A large wall in a hallway offered the perfect canvas to revisit a childhood memory. "My grandmother had a massive wall of photos," Waterson said. "I knew I wanted to recreate it." In Waterson's home, the assembled family photos date to the early 1900s. In one, her grandmother is a little girl, part of a wedding party. Another shows young versions of her father and aunt, the latter's poodle skirt giving away the decade. Waterson's family background is also why the long screened-in porch at the back of the house was a big selling point. "My family's from Louisiana," she said. "I grew up going to visit family there and sitting on big Louisiana porches." That's also why the long front porch, which Waterson said looks much the same as it did in 1916 photographs she's seen, now has a large gas lamp hanging above it: to give it that Louisiana feel. "It was not super simple (to add), but it had to be done," Waterson said. "This house needed it." The Watersons undertook some landscaping, too. After removing a driveway that cut through the side yard to the back of the house, they added grass and flowerbeds divided by a little walkway. The family's "five year plan" is to add a little apartment on top of the garage in back for family/guest overflow. Waterson said she shares the opinion of many historic homeowners, that she's a caretaker of the property. Indeed, it already had a history. About the name, Gravelotte? "It's not as fancy as it sounds," she laughed. She said the home's original owner also owned the gravel lot next door. Terrace Park Historical Society records list that original owner as T.R. Biggs, an early settler of the village. The "Gravelotte" name originally described Biggs' subdivision, those records show. Waterson said the house has had many uses over its long history, including serving as a doctor's office. Now, it has a fresh new look and layout suitable for a modern family.